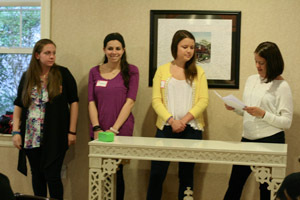 This past year was an amazing year for teen involvement at Gilda’s Club Westchester, and on Monday, May 7th we held our first Teen Recognition Night to honor those teens who participated in our program and volunteered their time and talents to make a positive impact on the Gilda’s Club Westchester community. Our Youth Committee (YC), a group of 35 volunteers from 15 schools throughout Westchester Country, held bake sales, passed out flyers, sold bracelets and spread the word about us and everything we offer to families impacted by cancer. Thanks in part to the efforts of the Youth Committee, as well as a generous grant from Sole Ryders & Friends, we were able to update our children’s room here at Gilda’s Club Westchester to now accommodate children, tweens and teens of all ages! The YC also helped with events at the Clubhouse, including Noogiefest, our annual Halloween party for children and families. Then in April the group spent a whole day volunteering for our 13th Annual A Cappella Extravaganza, an a cappella competition held at the Masters School, in Dobbs Ferry. Their hard work directly impacts the families that come to Gilda’s Club Westchester and has such a tremendous influence on the program we are able to offer our members. This year we had the honor of reading 66 essays written by students from 23 schools in the Westchester, Rockland and lower Fariflied counties, so we’re very proud to announce the winner of our annual “It’s Always Something” Teen Essay Contest: Samantha Faith Ayala! Samantha is a junior at Maria Regina High School in Hartsdale. You can read her essay here about coping with her dad’s cancer, entitled “Do or do not do… there is no try.” We thank Samantha for sharing her experience with us, and all of the teenagers who made fantastic, brave submissions this year. A special thank you also, to this year’s contest judges: Mayor of White Plains Tom Roach, White Plains Hospital President and CEO Jon Schandler, and Founding GCW Board Member Elizabeth Cohn Stuntz, MSW, PSW. Last, but certainly not least, we recently created the Red Door Teen Award to honor a special teen who has made a positive impact on the Gilda’s Club Westchester community. 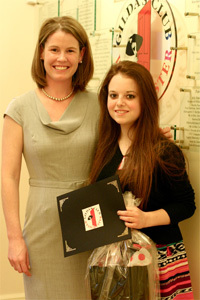 Our first Red Door Teen Award goes to Amanda Puglise, who joined Gilda’s Club Westchester in the spring of 2008 when she was in 8th grade and her mom was diagnosed with cancer. Amanda joined a group for kids who also had a family member living with cancer. There, she quickly related to other group members and her sensitive and empathetic nature helped to draw them in and bond the group. 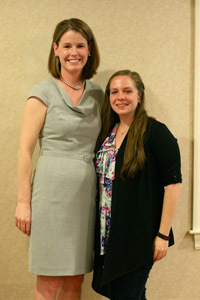 In Amanda’s freshmen year of high school, she began volunteering in several capacities. She served as a volunteer in the groups for younger children impacted by cancer and also joined our Youth Committee. She had personally experienced what Gilda’s Club Westchester has to offer, and felt strongly about finding a way to convey to others how supportive and helpful our community could be. Amanda has served as an elected officer of the Youth Committee for the past two years and continues to look for new ways to raise awareness in her school and the larger community as well. She has given a great deal of herself to Gilda’s Club Westchester over the past five years and we have been extremely lucky to have her. Thank you to all the teens who are helping to make a difference through Gilda’s Club Westchester. We couldn’t do it without you! 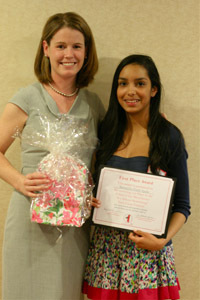 Jen Scully, Children, Teens & Families Manager with 2012 Teen Essay Contest 1st Place winner, Samantha Faith Ayala. Stacey Zanoni, GCW Program Social Worker (left) recognizes Youth Committee Officers Amanda Puglise, Samantha Miller and Chloe Williams. 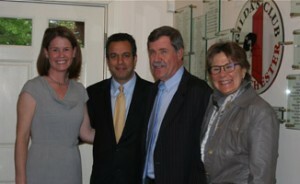 Jen Scully, GCW Children, Teens & Families Manager with GCW Board President William S. Null, Esq., White Plains Hospital CEO and President Jon Schandler, and GCW Founding Board Member Elizabeth Cohn Stuntz, MSW, PSW.